This procedure provides a detailed examination of the brain and ventricular system (the fluid containing spaces in the brain). There are many indications but the most common are headaches, strokes and other neurological events, trauma and changes in mental function. You will be required to lie on the CT bed with your head in a support holder, to limit movement. The bed will slide slowly into the gantry ring. This is wide and short and claustrophobia is not a problem. 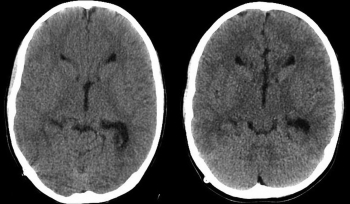 Depending on the indication, the initial scan may be followed by a repeat scan after the introduction of intravenous iodine-containing contrast medium. The X-ray tube will rotate around you. Other than for the possible introduction of the intravenous contrast, there will be no pain or discomfort associated with the procedure. An average examination lasts approximately 10 minutes.